Find the inspiration you need to build a portfolio that communicates your talents — and brings in new clients. If your portfolio website looks a whole lot like everyone else’s, there’s a good chance your talent will get lost in the crowd. Sure, your work is important. But it’s like product packaging: Even if what you’re selling has the same ingredients as a competitor, changes are they’ll nab the sale if they can beat you on presentation. 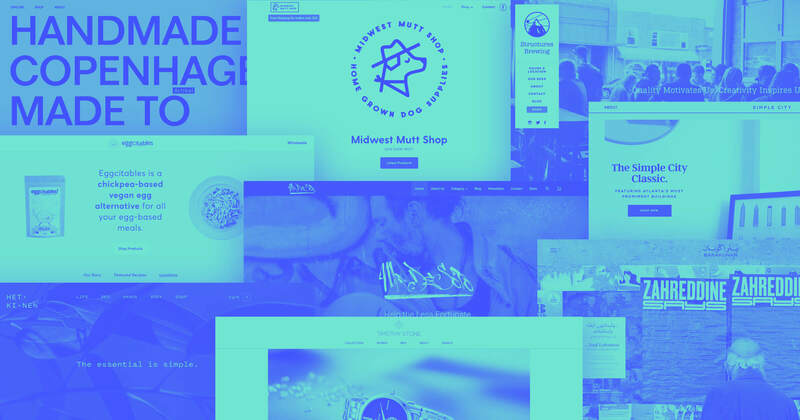 With that in mind, we’ve collected 9 outstanding portfolio websites to inspire you to think different when it comes time for your next portfolio redesign. A writer's portfolio can be a static experience. Unlike graphic design, where visuals can communicate talents immediately, reading takes more time. We hope (against hope) that a potential client reads what we've written and recognizes our talents for what they are. Is it possible to make a writer's portfolio more than motionless text on a screen? Joe Coleman proves that it is. Sliding it all the way to the left results in an apathetic, "So yeah, I'm a freelance copywriter." Sliding it to the far right results in a strobe light of a flashing screen. An animated finger repeatedly points to a phone number in red. It's not so much a call to action, as a command, shouted in your face at the highest volume. 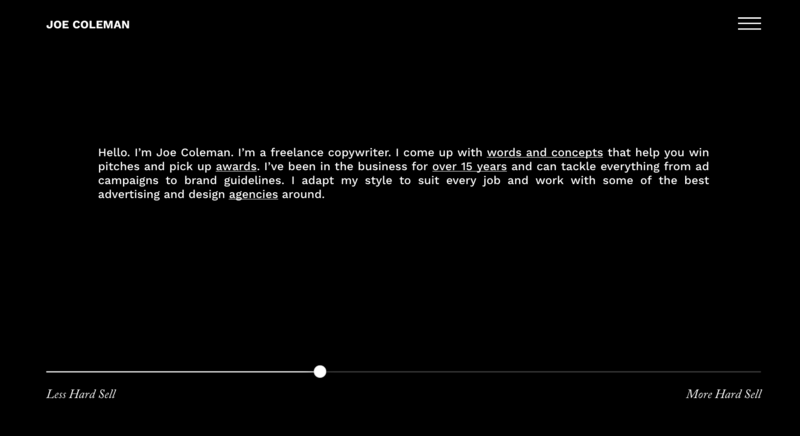 Joe Coleman's portfolio stands out with its creative approach and for not taking itself too seriously. 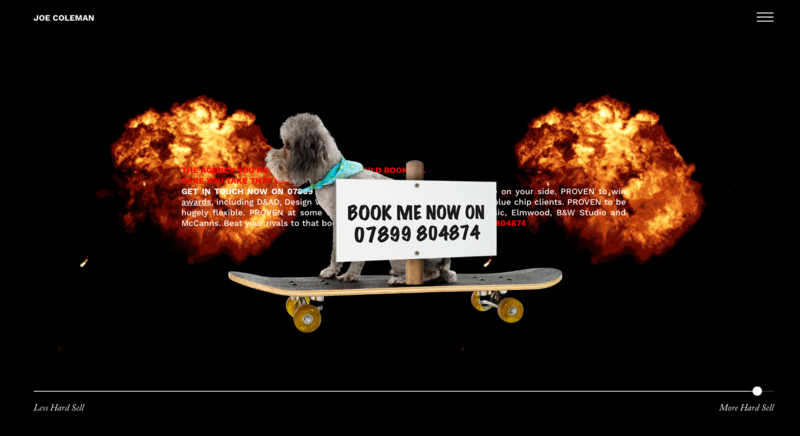 Explosions and skateboarding dogs may not be the first thing you think of for a portfolio CTA, but they sure add some drama. Jonathan Patterson bills himself as a freelance visual designer. His portfolio, with its playful color scheme and rigorous grid, offers up a solid representation of his talents. When we land on his page we're greeted with a grid of multi-colored boxes. Hovering over each section changes the background to black. This makes it stand out from the dazzling array of squares representing each section. He also uses animations that mimic the design process. We see text being filled in as we watch as well as the boxes surrounding the different elements appear as we might see them in a design program. It’s a nice nod to the design process and reinforces in our minds the skills that Jonathan Patterson brings. 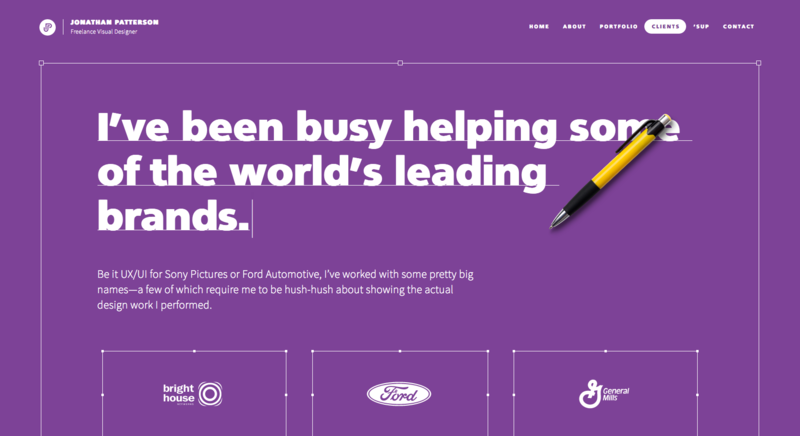 ‍Mimicking design tools within your website can be a nice way to remind someone just what goes into it. 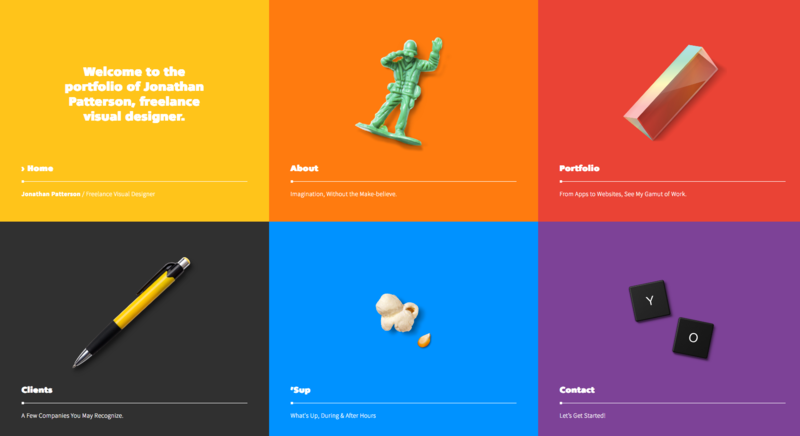 This portfolio lets the design speak for itself. Copy is kept to a minimum. And the tagline for his about section — “Imagination, without the make believe” — makes me jealous for not coming up with such a brilliant line myself. If this portfolio lacked animations, its typography and layout alone would suffice to make it a stella portfolio. But it’s the small details that really set it apart. He added in these little interactive graphic elements that you can move around. On one page there’s a pen, another a green plastic soldier. You can click on these and move them around. Yes, there's no point to this. But isn’t that the point of play? It sure kept me engaged. Eder Carfagnini is clearly an incredibly talented 3D artist. He’s created a cast of whimsical characters for a variety of projects. To be successful as this type of animator, you need to have an eye for details and Eder leaves no pixel unturned. 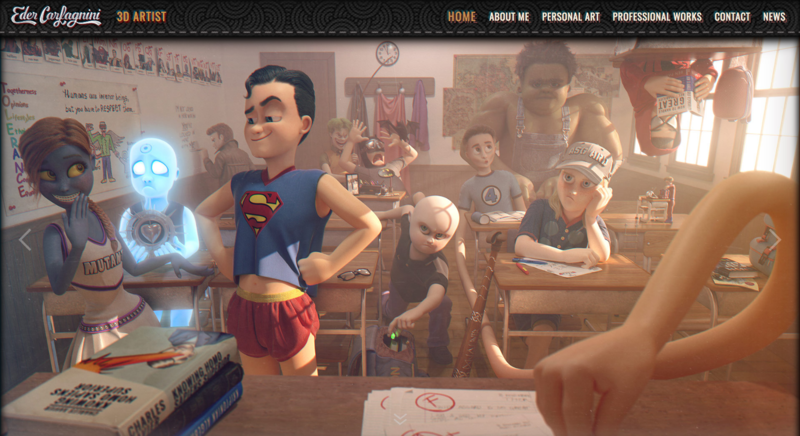 His landing page welcomes you with a revolving series of still images of his animation work. This is a great introduction and these visuals say so much about his skills. But what might work beautifully within the world of animation doesn't always translate to a usable website. There isn’t any visual cohesion to the different elements that make up the layout — which isn’t to say that that is necessarily a bad thing. Everything seems to be crafted with precision, but there’s just too much of it. It's like a traffic jam of busy elements that come together to create a usability road block. Take the Professional Works page. It is an impressive array of projects. But every element has a hover effect or some other type of interactive animation. Using too many of these effects makes it overwhelming and fatiguing to scroll through. It's an unfortunate distraction from his amazing work. The quantity of these animations also can decrease the load times of these pages. We only have so much time to keep someone's attention and anything that takes us away from the immediacy of a page may lose a user. I love Eder’s work, and he seems like someone who approaches every project with ambition. His portfolio would benefit from dialing back the dynamic elements a bit, as well as simplifying the amount of visual information on each page. This would put the focus on what we’re here to see: the characters he has created. With so many details at once, it’s hard to find the one thing we should be looking at. Then again, it's all a joy to look at. 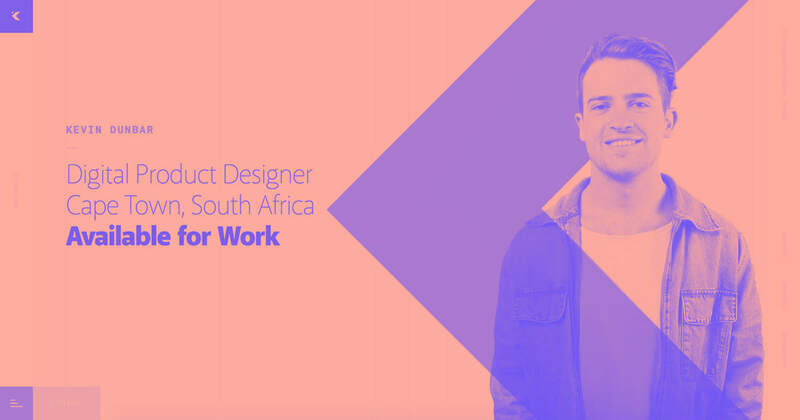 We’re fans of people blazing their own trails through the landscape of freelance web design. Anna Sabatini is has done just that. (And, for transparency’s sake, she’s now found a home on our QA team!) 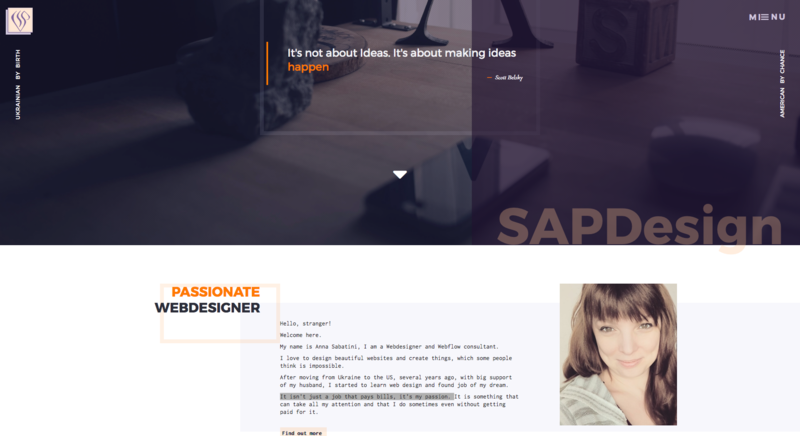 Her enthusiasm for her craft shines in both the design and copy of her portfolio. This page is a good representation of how far she has come. There’s nothing too fancy, but this one page has enough going on visually that it doesn’t fall into the drab grey void of minimalism. 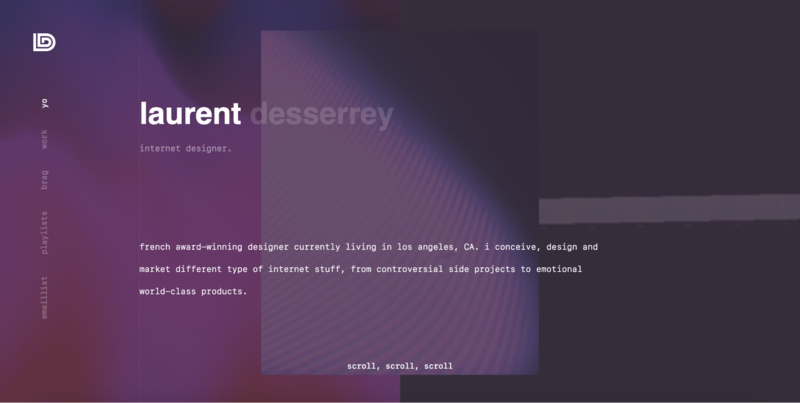 Dashes of color and a slight asymmetry within the layout keep things engaging, and she makes creative use of transforms and interactions in the hamburger menu, and the section dedicated to her offerings. 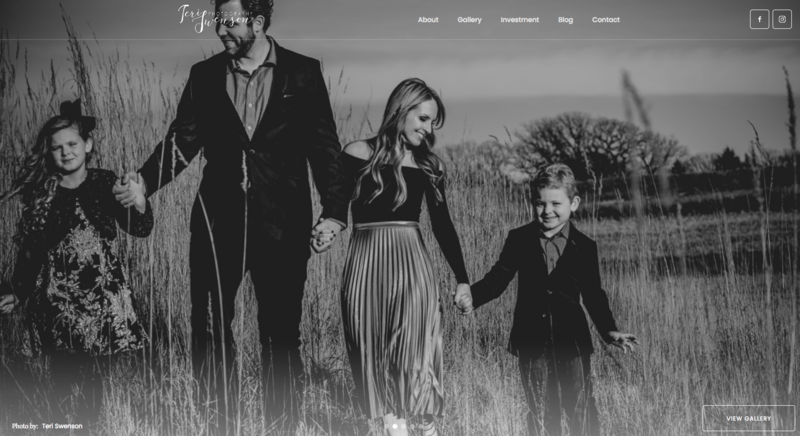 With easy navigation and a tasteful eye on the layout, Anna demonstrates that she’s a skilled designer who can create a fantastic website for you. 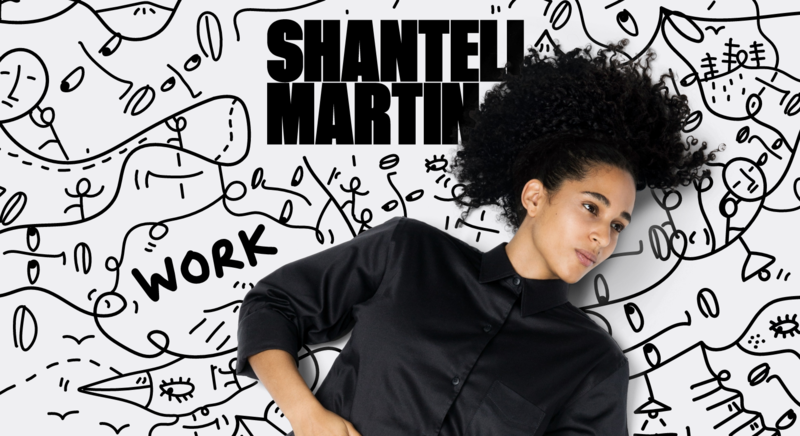 ‍Artsiness and design come together to create a stunning portfolio for Shantell Martin. Shantell Martin is a fine artist. Her hand-drawn line work has adorned everything from printed circuit boards to gallery walls. It's this same aesthetic that fills the negative space of her portfolio. And her drawings work just as well within this digital realm. It’s easy for a talented artist to have their work diminished by lackluster web design. But in this portfolio, Martin’s own work forms an integral part of the design and experience. As you scroll down the page, sections of her line art animate as if brought to life by your cursor. You can also open up an unconventional hamburger menu in the top, but it’s more fun to explore the whirls of lines and click the navigation. These line drawings are complemented by big, bold fonts. The straight lines of these fonts contrast with the looseness of the background art which makes for a big visual impact. Overall, the design provides a good mix of practicality and originality, balancing unconventional visuals with user expectations. Stacked blocks representing projects make for a stylish and impactful way to display projects. 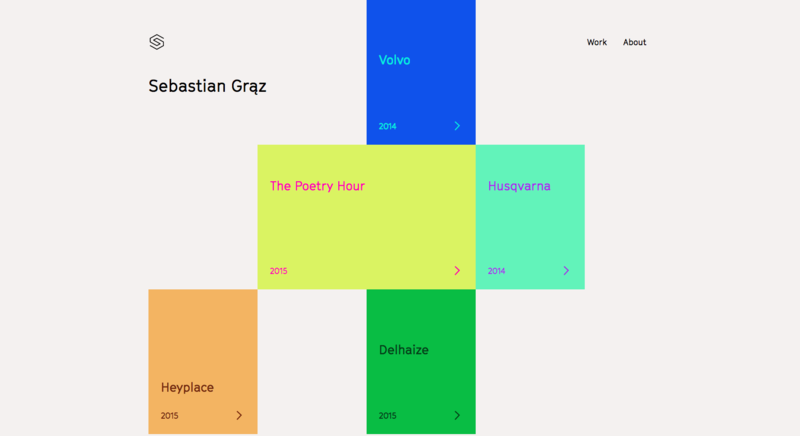 Sebastian Graz is a designer/developer hybrid who takes a minimalist approach with his online portfolio. He places examples of his work in the front and center of his design, so there’s no need to dig around for examples. 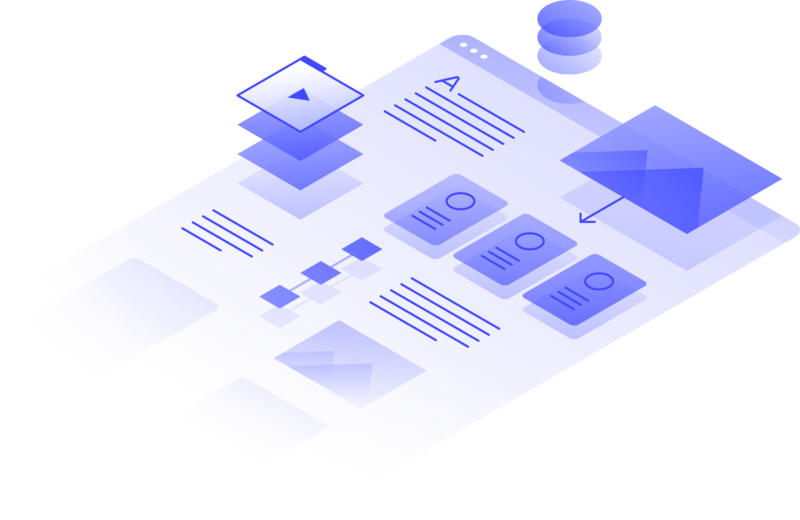 We see a stack of colorful block on the landing page, each representing a project. Hovering over each block makes it expand. An image corresponding with the project is also revealed. Text appears, describing his role on each project, e.g., "I led the design on a Volvo pitch." Often this type of information gets buried within the text or ignored completely. Communicating this in such an eye-catching yet straightforward way is smart design. This site does a have a bit of a “work in progress” feel to it, but we’re definitely eager to see more. ‍Teri Swenson has created a simple, yet lovely portfolio for her photography. Which happens to be perfectly in line with her aesthetic. Her landing page is free from any invasive text, leaving the revolving images of her portraiture to tell her story. Her work focuses on capturing the authenticity of people. We never see any images that look overly staged. We get an idea of who these people are through their honest expressions, which are expertly captured through Teri’s lens. She captures this same authenticity in the down-to-earth description of her life and work in the About section of this portfolio. Swenson lists her services in a section labeled “Investment” in the top navigation, which isn’t exactly what you’d call clear. Something like “services” or “photo packages” would give visitors a better sense of what the page holds. Which is far from insignificant, given that this page is probably a key conversion point. One of the hardest things about building a portfolio is figuring out how to organize one’s work. Teri organizes her gallery into the categories of Childhood, Lifestyle Newborn, Family, First Moments, and Motherhood, which nicely align with her products. It’s a smart move to group these together. It makes this gallery a stronger seller of these specific services than if these images were displayed in a less organized way. Victoire Douy’s portfolio features a balanced layout and a visually appealing color scheme. Victoire Douy is a French graphic designer whose focus is UX/UI design, but whose talents also extend to typography and illustration. 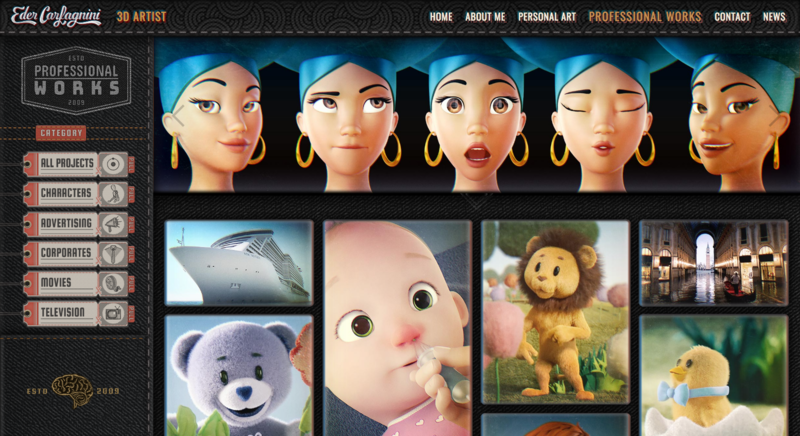 This is a beautiful portfolio, with careful attention paid to its palette. It’s a minimal design that doesn’t feel minimal. With simple navigation and subtle interactions, it all feels airy and effortless. One small point of confusion. 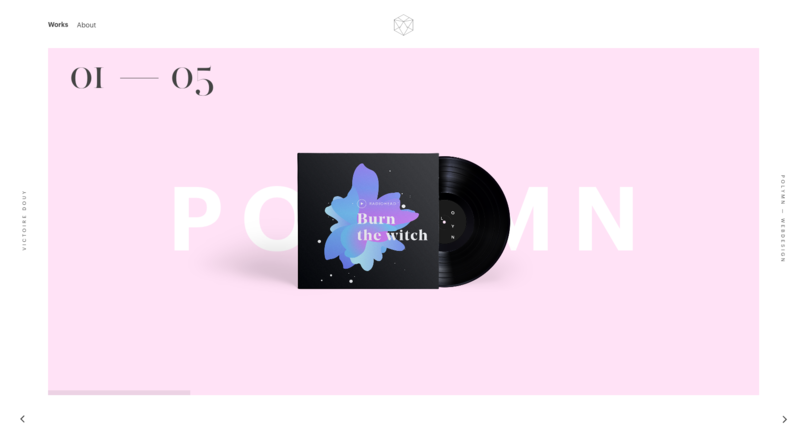 When I first landed on the website, I saw an image of a vinyl copy of the Radiohead album “Burn the Witch.” Anyone checking out this portfolio for the first time might think that Victoire did the album cover design. When you click through, you find out the project was a music website. It’s a bit misleading, but the colors on the album go so well with the rest of design it’s easy to forgive. It’s a small distraction, but this portfolio still wows with its visual cohesion and smooth user experience. Laurent Desserrey has designed everything from “from controversial side projects to emotional world-class products” — including the popular Tribe — and he brings his taste for the controversial straight into his portfolio. If you’re photosensitive or prone to television-induced seizures, you might want to steer clear of Laurent’s portfolio. That’s because it makes extensive use of visual effects that that wouldn’t be out of place in a glitch artist’s retrospective. Static, light, and motion radiate out from your screen, creating an almost hypnotic, thoroughly modern experience. Occasionally, this feels like it does a disservice to the content due to the constant distraction. But it’s hard to critique too extensively since the website itself feels so new and different. Hats off, Laurent. What are your favorite portfolio websites? We come across so many beautiful portfolios, narrowing down to these 9 was tough. So we’d love to see your personal favorites (other than your own, naturally). Share away in the comments!